KowCast Ep. 12 – JLA/Avengers Back Issue Spotlight feat. John Mayo – Kow Cast! Your Kowabunga Comics Podcast. 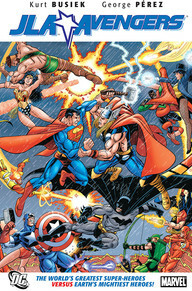 Listen in as Eric and James have a fun and spoiler filled back issue spotlight discussion on JLA/Avengers by Kurt Busiek (w), George Perez (p/i), and Tom Smith (c) with John Mayo, host of the Comic Book Page Podcast. Follow along as James and John put on a master class in DC and Marvel history, while first time reader Eric attempts to keep up!